"Dirty Harry" is a song from British alternative rock virtual band band Gorillaz' second studio album Demon Days, released as the third single from the album on 21 November 2005. The single peaked at #6 in the UK. Earlier that year, the song released as a promotional single on iTunes. An early version of "Dirty Harry" titled "I Need a Gun" was included on Damon Albarn's album Democrazy. On 8 December 2005 it was announced that "Dirty Harry" had been nominated for a Grammy under the category "Urban/Alternative Performance", but was beaten by Damian "Jr. Gong" Marley's "Welcome to Jamrock". The song's lyrics contain the line "The war is over so says the speaker with the flight suit on", a reference to George W. Bush's "Mission Accomplished" televised speech. Dirty Harry is also a 1971 film directed by Don Siegel. One of Gorillaz's earlier singles is the name of the actor who played this film's title character, Clint Eastwood. The single cover is similar to that of the film Full Metal Jacket. Dirty Harry is also a nickname for the nuclear test Upshot-Knothole Harry, which created unusually high amounts of radioactive fallout. The video was first released on 25 October 2005 to subscribers of the Gorillaz website mailing list. Like the video for "Clint Eastwood", the video for "Dirty Harry" references the film of the same name. "Dirty Harry" is one of the few Gorillaz music videos to be filmed on-location, the others being "Stylo" and "DoYaThing". They were going to use a computer animated desert, but it turned out simply flying the crew to the desert was cheaper and easier. The video was shot in the Swakopmund Desert in Namibia. Most of the video features shirtless 2-D and an animated version of the San Fernando Valley Youth Chorus stranded in the middle of a desert, following what appears to have been a helicopter crash. The survivors keep themselves entertained with the song while awaiting the arrival of rescuers, portrayed by Noodle and Murdoc crewing a South African Defence Force Casspir mine-proof vehicle driven by Russel (who wears a Fu Manchu). The song and video feature a guest appearance by Pharcyde rapper Bootie Brown, who leaps out of a sand dune in World War II military fatigues to perform his verse of the song. 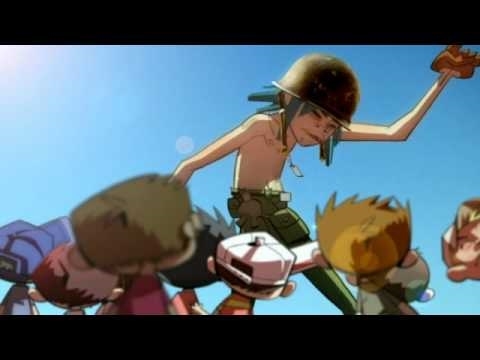 In the end of the video the Gorillaz, the children and Bootie Brown depart the crash site in the military vehicle, which breaks down meters away. The themes in the single, as well as the themes in the entire album are all based on Damon Albarn's observations on the state that the world is in today. The helmet which appears on the single cover and the poster for the video, seen in the cinema section of the Gorillaz website, is reminiscent of the Full Metal Jacket film poster.